Tokyo, Japan – May 18, 2015 – LINE Corporation has released revenue and usage statistics for LINE Creators Market, its platform that allows users to create and sell their own LINE stickers ( https://creator.line.me ). The figures cover the first year since the sale and purchase of creator-produced stickers began on May 8, 2014 to May 7, 2015. LINE Creators Market is a platform that allows LINE users all over the world to create and sell their own LINE stickers. After passing LINE’s review process, creators’ stickers go on sale in LINE STORE ( https://store.line.me ) and the LINE in-app Sticker Shop where they can be purchased by other LINE users. Approximately 50%*1 of sales for these stickers goes back to the creator after a 30% service charge from App Store, Google Play or other relevant app shop is deducted. Since creators’ stickers that have completed the review process first became available for purchase on May 8, 2014, over 100,000 sticker sets have been put up for sale. 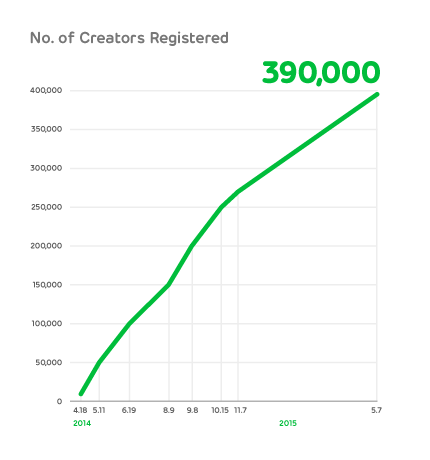 As of May 7, 2015, over 390,000 creators from over 156 countries have signed up for Creators Market, and the total amount of revenue generated from the sale of creators’ stickers has exploded to over JPY 8.946 billion*2. Taking a closer look at sales of individual sticker sets, the average earnings for best-selling stickers reached JPY 50.5 million for the top 10 sellers. The service also hosts many creators with multiple sticker sets for sale. The statistics for individual creator revenue show that the average earnings for the best-selling creators was JPY 109 million for the top 10. Some creators were able to generate over JPY 100 million in sales for the first time in the history of the service. Many characters originally designed as creators’ stickers have received merchandising and publishing deals, and more still have gone on to collaborate with other corporations, proving that the sticker-based platform has become an incubator for creativity and nurturing new ideas. LINE Creators Market plans to add new features that promise to make stickers easier to create and search for in the future. LINE is releasing LINE Creators Management to help top-selling creators merchandise and manage the rights of their products in order to further expand the options open to sticker creators. This new service was created to connect creators with companies and other possible licensees in order to stimulate corporate tie-ups and other merchandising deals featuring sticker characters. Creators Management also offers trademark application support and helps creators protect their products against piracy. The service has agreed to a partnership with T-ARTS Company, Ltd., a toy maker headquartered in Tokyo and led by CEO Hiroyuki Usami, further expanding the new service’s ability to support creators. LINE plans on increasing the number of partnerships and supported countries available in the near future. The selection of creators for affiliation with LINE Creators Management will be conducted using the following criteria. LINE will contact potential candidates about possible partnerships directly. 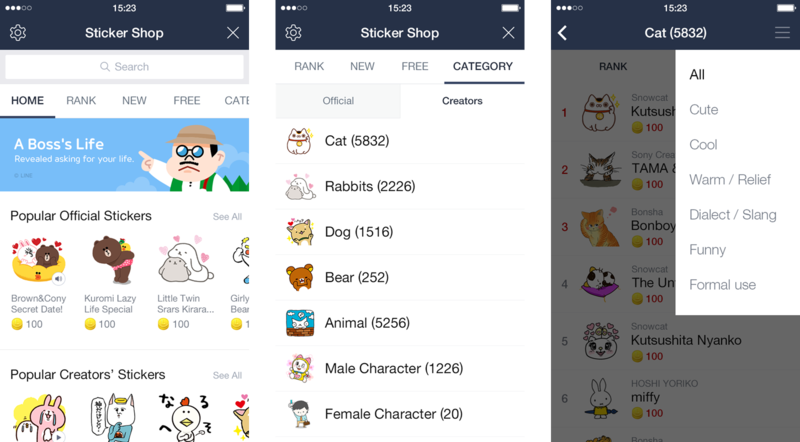 LINE will be releasing a major update for its in-app Sticker Shop in order to increase the appeal of creators’ stickers to potential buyers and make them easier to search for. The new Home page for the shop showcases creators’ stickers alongside official stickers, as well as offering users the option to search for and view stickers by categories that include cats, bunnies, dogs and other popular animals as well as male and female characters, making finding the perfect sticker set easier than ever before. By helping creators and new stickers get their start and finding top creators for future management opportunities, LINE hopes to build an entire ecosystem centered on creators and their creativity. As the largest and leading provider of sticker-based communication in the world, the company also hopes to continue opening new avenues of communication through LINE Creators Market and beyond. Please note that the figures published in this press release may differ from those published in financial statements due to potential accounting differences caused by methods used to calculate the value of Coins and LINE’s policies. 1:Creators are eligible to receive this amount after any income tax and other applicable service charges have been deducted. The tax rate applied varies depending on the country of residence of the creator and purchaser. 2:Total sales are calculated by converting the number of sticker sets downloaded to the equivalent amount of currency. Actual totals may vary. Additionally, the figures published in this press release may differ from those published in financial statements due to potential accounting differences caused by methods used to calculate the value of Coins and LINE’s policies.